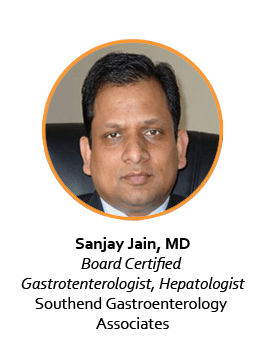 Dr. Jain is a board certified Gastroenterologist and Hepatologist. He is dedicated to promoting awareness of colon cancer, its incidence, risk factors and ways of prevention and early detection. He completed his Internal Medicine residency and Fellowship in Gastroenterology at University of Louisville Hospital in Louisville, Kentucky. He is proficient in all fields of Gastroenterology and Hepatology and performs therapeutic and diagnostic endoscopy including colonoscopy, polypectomy, upper endoscopy, biliary and pancreatic endoscopic procedures, as well as capsule endoscopy. He practices medicine in Louisville, Kentucky.